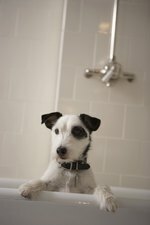 Whether a dog is infested with chewing lice or sucking lice, treatment is pretty much the same. The chewing louse nibbles on the dog's skin, whereas the sucking louse makes meals of canine blood but doesn't chew. Signs of infestation are the same: scratching, poor coat quality and hair loss. Take your dog to the vet if he exhibits any of these symptoms for diagnosis and treatment. Certain flea shampoos can kill lice, but topical flea preventives are more effective. Trichodectes canis, chewing lice, are more active than the sucking type. You can see them moving on your dog's skin. These flat, minute, light-colored insects don't have wings but do sport three pairs of legs. You're likely to find chewing lice near wounds or on body orifices. That means they are more often found on the tail or head. If you inspect your dog, you'll probably see nits -- lice eggs -- on hair shafts. While chewing lice are easily transmitted between canines, they don't bite people. Linognathus setosus, the sucking louse, doesn't move as quickly as the chewing louse. It has a different physical appearance, too: a much narrower head and wider body. Sucking lice often create lesions in a dog's skin, which can lead to secondary bacterial infections. These pests are primarily found around a dog's head and neck; the area under the collar is a particularly common site. Sucking lice are host-specific -- they won't bite humans or felines. Your vet diagnoses a chewing lice infestation by examining your dog and observing the symptoms of infestation or seeing lice or nits. If your dog has been on a monthly topical flea preventive for some time, he's unlikely to develop a lice infestation. Common prescription and over-the-counter flea control products also get rid of lice. These include Revolution, a prescription medication containing selamectin, and Frontline and Advantage, available over the counter and containing fipronil and imidacloprid, respectively. They don't kill eggs, so a dog who's lousy will require treatment twice. Any matted areas require shaving. If your dog suffers from secondary bacterial infections from sucking lice lesions, your vet will prescribe antibiotics as treatment. Any dog in your home requires treatment for lice, even if only one animal appears affected. You can throw out your dog's bedding, collar, brushes, toys, bowls and replace them, or sterilize them by washing them in bleach and hot water. Place these items in your dryer and put the temperature control on high to eradicate nits. If you bring a new dog into your home, treat him with a flea control product that eradicates lice before he crosses your threshold.